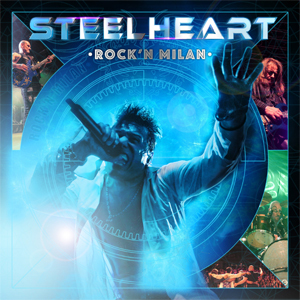 Frontiers Music Srl is pleased to announce the release of Rock'n Milan, a live album and long-form video of STEELHEART's performance at Frontiers Rock Festival IV (2017) in Milan, Italy on December 7, 2018. Pre-order Rock'n Milan on CD/DVD and stream the single, "My Dirty Girl" HERE. Check out a preview of the show with a live video clip of the song "My Dirty Girl" on KNAC.COM HERE. ""My Dirty Girl" is a track from our latest studio album, Through Worlds Of Stardust. We love playing this one live as it has such a great dirty rock vibe to it! The night this was filmed was a hot, sweaty rock 'n roll night to remember in Milan, Italy. Sadly though, this was Kenny's last performance with STEELHEART before he passed away shortly thereafter. He is here in spirit forever and I'm happy that we have this full set captured. I hope you all enjoy this video and album. So much more to come. Love you all!" The band stormed the stage ahead of the, at the time, forthcoming release of their comeback album, Through Worlds of Stardust, which is represented with the inclusion of "My Dirty Girl", while the rest of the setlist includes STEELHEART classics! With tracks culled from the self-titled debut album and from the Rockstar movie soundtrack, singer Miljenko Matijevic was in fine form and delivered an amazing performance to the wowed crowd!